The Offensive as described in the Kriegskalender. As Summer arrived the tensions caused by the German Spring offensives in Flanders, by Soissons, Reims and Noyon intensified. It was clear to all the the western front was where the outcome of the war would be decided. it was also clear to the Germans that they were loosing energy, they were loosing men at more or less the same rate that the allies were gaining them. By June 1918 over 1 000 000 fresh American soldiers had arrived in France. The one thing Ludendorff knew he could count on was the spirit of his soldiers, and because of this he was confident when he launched his offensive on the Marne and in the Champagne in July 1918. The action was meant to draw in the allied reserves so he would face less opposition when he launched his final blow in Flanders. Like all great plans it relied on surprise. He did not know that Foch knew about these plans 14 days before the beginning of the offensive, it had been betrayed by German deserters. The three armies of Boehn, Mudra and Einem with a strength of 45 divisions lay in wait on the banks of the Marne and in the chalky hills of the Champagne. At 4:00am on the morning of the 15th of July the 2010 batteries of artillery began to roar. Almost right away the French artillery responded aiming for the Germans chosen crossing points and destroying a third of their pontoons. Barges being pushed across the river were peppered with machine gun bullets but still the assault troops (Stosstrupps) managed to gain a foothold on the opposite bank of the Marne. The fighting was desperate as they struggled to keep their foothold. In an amazing feat pioneers under heavy fire managed to build a 70m long bridge at Vincelles. That evening a 6km bridgehead had been created at a very high cost in blood. For the divisions in the Champagne it seemed to be a walkover. The French artillery did not answer the German bombardment. The Germans rushed forward and pushed into the enemy positions.... they were empty! The French had pulled back. Those surprised were not the defenders but the attackers. The German troops continued to follow their rolling bombardment in the direction of the Roman road when suddenly the French barrage rained down behind them and from the second line of defence the machine guns opened up. The Germans were caught in the wire, no way forward, no way back. The battle was lost on the first day, the next two days would see violent attacks and counter attacks but the French managed to gain the upper hand. The German high command recognised their error and stopped the offensive. The question they asked themselves was "What now? The attack in Flanders - or an enemy counter offensive? 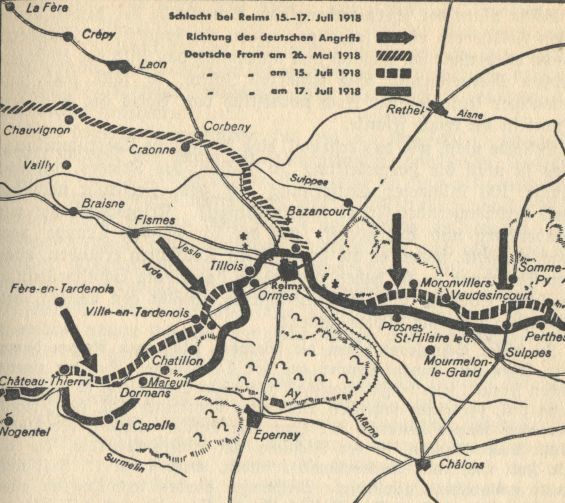 A map showing the Marne (West of Reims) - Champagne (East of Reims) offensive and the German attempt to encircle Reims. Relative to the above text are the advances between the 15th and 17th of July.